Drivers crossing JD Young Bridge just outside Sarasota were alarmed to see a semi-truck dangling off of the bridge early one July 2018 morning. Fortunately, the driver of the big rig did escape unscathed after the terrifying incident. According to the driver who was behind the wheel of the semi, he lost control of his vehicle after an automobile unexpectedly changed lanes in front of him. As he braked and swerved to avoid the car, he rammed into the concrete railing on the bridge, dumping the cab of his rig over the edge. The perilous event backed up traffic and inconvenienced many, but no injuries were reported. 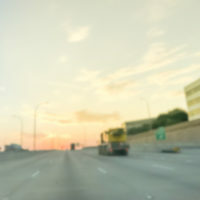 What do Truckers Wish Drivers Knew? Please don’t cut in front of us! With our weight, the stopping time for our rigs is longer than you might think. If you cut us off, there’s a pretty good chance we’ll either rear-end you, or veer off with the potential of losing control of the rig. And in an accident between a semi and a regular vehicle, the occupants of the vehicle experience almost 80 percent of the fatalities. Give us lots of room when we’re trying to navigate a turn. They’re going to be wider than what you’d make in your car. If you see our signal, especially along a freeway ramp or intersection, please try not to pull up beside us. You’re difficult to see, and might wind up getting smashed. Don’t drive in our blind spots. Think of it this way: if you can’t see us in a mirror, we probably can’t see you. Instead of driving next to us, you’re much better off staying a safe distance behind, or quickly passing us. Avoid aggressive driving. If a trucker irritates you, don’t try to get even by cutting in front or weaving in and out of traffic. It’s much too dangerous to get into it with a truck driver. Don’t tailgate us! If, for any reason, you wind up rear-ending a semi, it’ll be like ramming into a brick wall. No driver intentionally brings harm to others on the road, but sometimes serious injuries occur despite everyone’s best efforts to remain safe. If you find yourself involved in crash involving a big rig, contact us at the Law Offices of Robert W. Elton in Daytona & Ormond Beach. We’ll help you figure out the best way to deal with the aftermath of injuries and property damage. Schedule your confidential consultation today.